For geographic areas with diverse and dynamic weather conditions, nothing offers greater value for the money than EEC's line-up of popular Defender Series C-Band weather radars. 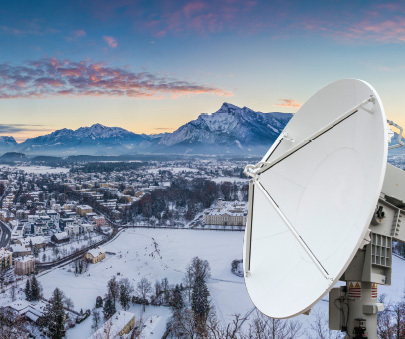 The choice of weather services, national governments, broadcasters, and businesses around the world, EEC can custom configure a C-Band solution for almost every need. EEC C-band radar - the benchmark standard around the world. For most areas of the world, nothing offers a better value than the proven line-up of C-Band radar systems from EEC. Even in challenging environments, our C-Band systems provide powerful and accurate information. Perhaps most importantly, the specifications of our C-Band radars can be customized to meet a wide range of demands and uses. With years of innovation and refinement behind them, the EEC 250kW and 350kW C-Band radars are now among the most popular radars in the world. Thanks to their perfect balance of power and effective range, these systems have evolved to become the ideal choice for customers with a diverse set of weather detection demands. You can choose to equip them with either reliable magnetrons or klystrons and in either single or dual-polarity configurations. The idea behind the ingenious Defender C500 is simple: If 250kW is the most popular, most practical single-pole configuration; then the best configuration for dual-polarity applications should be 250kW of power delivered in both the horizontal and vertical plane. Developed specifically for the most effective dual-polarization performance, this 500kW magnetron system is the radar for both today’s needs and tomorrow’s technology. The most powerful C-Band in use, with an incredible 1MW of power, the Defender C1000 is the choice of local and national TV broadcasters looking for that extra edge in weather detection. Utilizing this powerful system broadcasters can now detect, depict and warn viewers of approaching severe weather while providing a dramatic and visually stunning data display. With any EEC C-Band radar, our turnkey design, manufacturing, and installation processes allow us to configure your system to your exact specifications. Among the many options are single or dual-polarity transmitters and a variety of full-featured control and display systems. For a clean and true picture of mid to long range weather events, we will match your EEC C-Band system with the precise Doppler processing of our super-sensitive IQ2 signal processor and digital receiver. You can even choose the installation and radome that best fits your environmental needs. Flexible configuration options that maximize available bandwidth on any standard TCP/IP network.